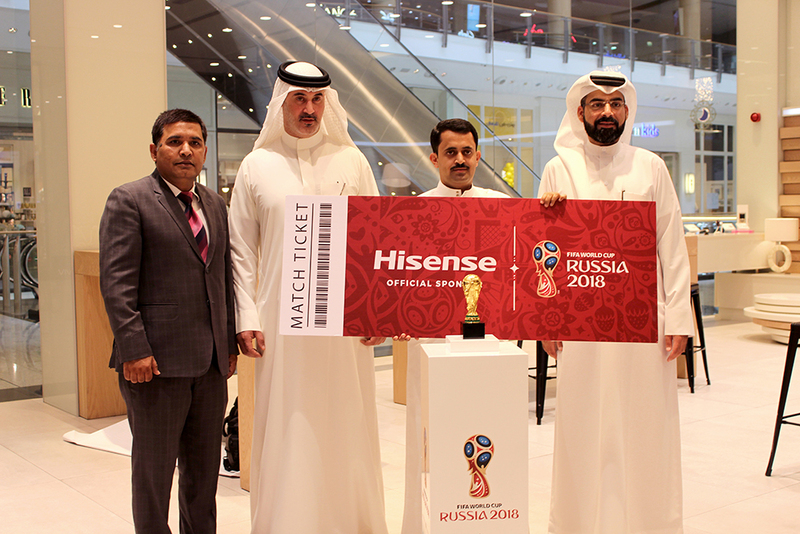 Following VIVA’s month-long promotion which gave customers the chance to enter a raffle draw upon purchase of any Hisense TV with VIVA Device Add-ons, VIVA Bahrain in partnership with Hisense, has announced Mr. Mohammed Qaid Al Zamzami as the lucky winner of an all-expenses paid trip to the 2018 FIFA World Cup in Russia. The prize entails a semi-final match ticket along with BD 1000 in cash to cover any expenses of hotel and accommodation. The draw took place in the presence of a representative from the Ministry of Industry and Commerce and Hisense Bahrain in Goods Trading Company (GTC) Premises located at Sehla. The winner received his gift at the VIVA City Center Shop in the presence of Mr. Jamal Al Sayed, Public Relations Manager, VIVA, Mr. Ali Mohammed Akbar Khan- Assistant General Manager- GTC – Hisense Bahrain and Mr. Abdul Jabar- B2B Sales Manager- GTC – Hisense Bahrain.